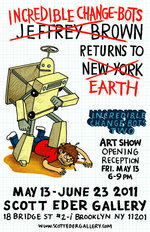 Jeffrey Brown's CHANGE-BOTS invade New York next weekend! 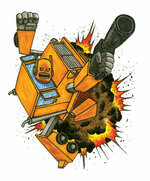 News | Jeffrey Brown's CHANGE-BOTS invade New York next weekend! 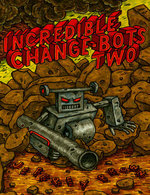 If you've followed Jeffrey Brown's blog, you may have seen the amazing Change-Bots-themed art he's been creating lately to celebrate the release of Incredible Change-Bots Two. Well, if you live near New York, now's your chance to see it (and him) in person! Jeffrey will appear at Scott Eder Gallery Friday night, May 13 to open a monthlong exhibit of his art from Change-Bots Two, which runs through June 23. THEN, join Jeffrey for a signing the next night, Saturday, May 14, at Desert Island in Brooklyn! Click "Read More" to see the flyer for the event, as well as a photo of Bew! Bew! Bew!, the giant battle drawing he'll unveil at the gallery!